Award Winner of the Network Book Prize for 2017 by the Scientific and Medical Network for a book written by a member that makes the most significant contribution towards a new world view. How do we create a good future? This deceptively simple question is the central challenge of human life. Indeed, the question brings to center stage the most distinctive and empowering capacity of the human mind: to be able to consciously imagine, think about, and intentionally pursue preferable futures. I refer to this multi-faceted psychological capacity within all of us as “future consciousness.” Our unique conscious minds, reflecting and amplifying nature’s vast and pervasive evolutionary process, have achieved an evolution in evolution—a jump to purposeful evolution—through future consciousness. Future Consciousness: The Path to Purposeful Evolution reveals how, through the heightening of future consciousness, we can flourish in the flow of evolution and create a good future for ourselves, human society, and the planet. "Lombardo has written a masterpiece, a must-read book, not only for futurists, psychologists, social scientists, scholars, and academics of every type showing them how to improve their thinking about future consciousness, but also for ordinary people to improve the quality of their future daily lives... It is a powerful and convincing statement. Lombardo's book is one of the most creative I have read." "Tom Lombardo is probably the single most impressive thinker, philosopher and author I have met in recent times. His unique perspective about wisdom and future consciousness, his eye for what matters in life and his depth of knowledge and experience make this book a must-have for those concerned about the collective future evolution of human society". "Tom Lombardo’s worldview is like a multiverse: vast, in depth, multidimensional. Each new book from this world renowned futurist is a new stellar light enlightening the understanding of what it means to be human: be conscious, imagine new worlds, build our collective future. Thanks Tom for this vital breathing!" "Tom Lombardo's [book] is a masterpiece of creating a deep understanding of the continuum of society's evolution at the same time that it sets the stage for the ongoing transformation of human consciousness that is needed for the sustainability of humanity during this shift from an Industrial Age to an Ecological Civilization. His book is a must read for anyone who wants to understand how to re-conceptualize the future." "Tom Lombardo's exploration of future consciousness examines a state that many search for in vain, that of full self-actualization, and lays out both the strategic and tactical paths to reach that state. Based in the inherent wisdom of foresight thinking, Dr. Lombardo describes the nature of creative flourishing in both the empirical and spiritual realms. This is an extraordinary accomplishment and deserves the laurels that it will undoubtedly receive." "Tom has done it again! Always compelling, hugely informative, unconventionally provocative and wisdom inducing, he has created a definitive book on the psychology of future consciousness! A valuable resource for futurists and non-futurists alike." “As ‘ordinary’ people seeking a good life and good future, character virtues and wisdom are essential to our ability to flourish, evolve, and extend ourselves into tomorrow. 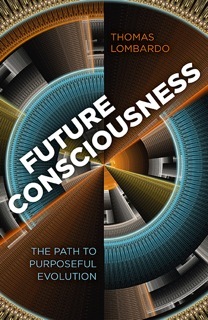 [In this book] Tom Lombardo provides insights for achieving a good future and enhancing our future consciousness. Whenever I read his works or listen to his talks I am always compelled to reflect on my own self growth and do something with my new awareness." "Lombardo challenges us to an Odyssey, with wisdom as a beacon for heightening our future consciousness. This grand narrative of evolution of the human mind and of the search for a good future is applicable as thought-provoking reading for both academic courses and individuals."